Big Dope is making me read the daily news and report on it. He says it will help me understand the nature of your species. So far it has had the opposite effect. I am, as is often the case with Americans, unable to think clearly or bewildered. (Editor's note: he means "confused"). Please help if you can. I have to use his computer and the jerk is coming back in a short while to check on my progress. Does anyone have the stats on how many of the pundits who are apoplectic over the prisoner exchange currently dominating the news ever served in the military? I have identified Senator John McCain but he was for prisoner exchanges ere he was against them. Are there others? What if, after reasoned investigation, the worst case is the young man in the news wandered off his post and colluded with the enemy? He will likely suffer the consequences. Gosh, I found where George W. Bush wandered off his post in the Air National Guard and he wasn’t even in a war zone. Your Supreme Court later elected him President. Your President Ronald Reagan (illegally it seems) colluded to sell weapons to Iran for funds to (illegally) fund a little private war of his in South America. I sense that some of you would make him a saint. to preach morals to you? - C.W. Perhaps what your species needs is an “Equal Apoplexy Law,” i.e. what’s unfair for the goose is unfair for the gander, somewhat like Mrs. Big Dope often says. 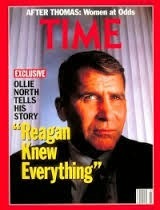 Oh yes, one of the apoplectics is a man named Oliver North. He did serve in the military but seems to have disgraced it forever by facilitating the aforementioned Iran-Contra arms deal, so he would not seem to count. I saw a comment on Big Dope’s Facebook page the other day where a citizen said he would always vote for a veteran. Perhaps he never heard of Colonel North and the faint smell of sulphur that is said to surround him. I suspect that smell is quite strong in Washington D.C. at present. Oh, and clicking on an ad will help me buy my own computer.